If you have Stripe or Square activated in your Setmore account, you can also enable the option to take customer payments from the Booking Page. The payment phase takes place as the customer is booking their appointment online. Not only will this ensure a firm commitment to show up from customers, but also it delivers greater convenience since you can forego the payment process during the actual appointment. With Booking Page payments activated, you can also require full payment upfront, require a deposit on the service, and apply discounts or service fees. We'll go through each feature in the instructions below. Navigate to Settings (gear icon in left menu) > Payments > Booking Page. In Step 1 and beneath where it says "Do you want to accept payments on your booking page? ", click the On/Off switch to the "On" position. Booking Page payments are now activated. In Step 2 and beneath where it says "Is payment required at the time of booking? ", use the dropdown menu to choose between optional payments and collecting payments upfront. 1. In Step 3 and beneath where it says "Do you want to apply extra charges or reductions? ", click the "+Charges or Reductions" button. 2. In the menu that appears next, configure your discount or fee using the form fields. Using this method, you can also require customers to pay a certain percentage of the service cost as a deposit, and collect the remainder of the service cost at the time of the appointment. 3. To delete a fee or discount, click the "X" next to it and click "Delete" to confirm. 1. 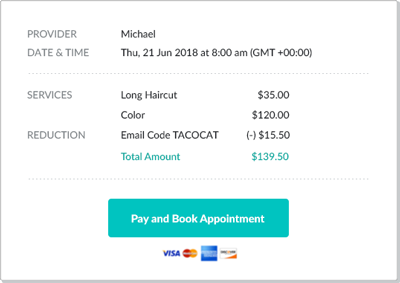 As customers schedule an appointment through your Booking Page, they will now be prompted with a penultimate step right before the confirmation screen, to pay for the service. If you made upfront payment mandatory, then they must pay for the service before the appointment will be scheduled. Otherwise they will be given the option to skip payment. 2. A timer appears above the payment window, giving the customer 5 minutes to complete the booking. If the customer fails to complete the booking in this timeframe, they will be redirected to the start of the process and asked to schedule the appointment again. This frees up the timeslot for another customer. If you have “Provide Multiple Services” enabled in your Booking Page configurations, then when customers select multiple services from your Booking Page, they will be prompted to pay for the total cost of those services at checkout (and before they confirm booking their appointment). Navigate to Apps & Integrations > Your Booking Page (Configure) > Booking Policies. Scroll down to the feature titled “Provide Multiple Services” (it’s about halfway down the list of options). Click the toggle switch to the “On” position. Setmore will now automatically total the cost of multiple services when customers book online. Once a payment is submitted, the receipt will appear in the Appointment Details window for each of the bundled services. 1. In your Setmore calendar, click on the appointment for which you would like to verify payment. In the appointment pop-up window, click the "Edit Appointment" link at the bottom of the frame. 2. In the Appointment Details window, click either the Payment tab or the Pay Now button. 3. The Payment tab will list all payments or refunds made for this appointment.